NEW HOME BUYER'S NEWS: FHA - Heritage Real Estate Services Inc.
Federal Housing Administration officials announced that they will reduce the annual mortgage insurance premium for FHA loans by a quarter of a percent. The lower MIP rate will apply to most borrowers who use the FHA program to buy a home in 2017, and will save them an average of $500 per year. The lower insurance premium takes effect on January 27, 2017. Rising home values and mortgage rates have put the squeeze on home buyers lately, and have reduced mortgage loan application volume as well. Borrowers who use the FHA loan program have another added cost, in the form of an annual mortgage insurance premium, or MIP. As a result of rising housing costs, and the added burden of the annual MIP, FHA loan application volume has been on the decline lately. So federal housing officials are making a change to attract more borrowers. The Federal Housing Administration will lower its annual mortgage insurance premium (MIP) by 25 basis points, or 0.25%. This reduction will apply to most new mortgage loans with a closing / disbursement date on or after January 27, 2017. The first HUD mortgagee letter of 2017 was sent out to lenders earlier today, with additional details about the annual MIP reduction. To learn more about this FHA program change, refer to HUD Mortgagee Letter 2017-1, which is available online in PDF format. 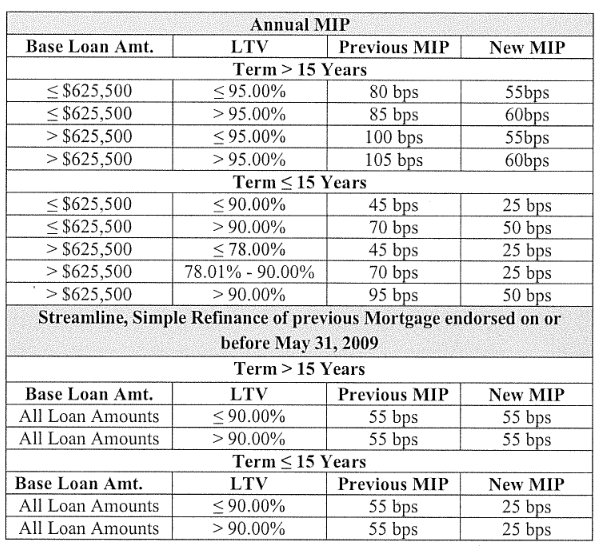 Here’s a screenshot from the official policy change letter, which shows the current annual MIP as well as the reduced premiums that will take effect later this month. Note the “New MIP” column in this chart.